Sometimes, it is necessary to create a custom template for allocating email addresses to users based on certain criteria. In SBS2008, this is relatively easy to do via the Recipient Policy Wizard in the Exchange Management Console. You can create and edit Recipient Policies in the Exchange System Manager, Recipients, Recipient Policies. Create a new policy or double-click an existing one to existing one. In the E-Mail Addresses (Policy) tab, click New to create a new policy rule/template. %rxy : Replace all subsequent characters x with character y in username. If x = y, the character will be deleted. For more information, refer to examples from the KB article. In Exchange 2003, Administrator accounts are denied access to mailboxes. As such, the EXMERGE utility will fail to export mailboxes when run using the Administrator account. To enable the Administrator account to use EXMERGE for exporting user mailboxes in archival situations, the following fix must be applied. Right Click on the server name, and select properties. Select the Security Tab, and click the Advanced Button. Untick the Check Box, Select Copy. Then select all Deny Permission Types, and click Remove. EXMERGE should now run properly. On many of my early installations of SBS2008, I had the unfortunate situation of not allocating enough hard drive space on the C: drive. My opinion has always been to move data and other system information out of the C: drive to other drives, and keeping the C: drive to a reasonably small size. I though that size was 60GB. I was wrong. I would recommend setting the C: drive to at least 80GB or more. The easiest way to remedy this situation is to immediately free up disk space. Fortunately, there are some great articles on how to do this. Other things, which should have already been done via the SBS Console is moving the Exchange database, Windows Update Repository and Sharepoint database out of the C: drive. They can be found here. I received an email from a client a few days ago. “Does the server have a limit on the size of emails it will accept? I seem to recall a 5mb limit. For many organizations, a limit is imposed on attachments in emails to “save bandwidth” since data is counted for broadband in Australia. I found an excellent blog which listed the various places to look at when making changes to enable attachments beyond the default 10MB limit which is set in SBS2008. All these options are located in the Exchange Management Console. 1. Setting Organizational Limits. This affects the global settings. In an organization with multiple servers, this will affect all servers. Open up properties for Transport settings as shown. Change the settings as required. 2. Setting Receive Connector limit. This affects incoming messages received by the server. Change the desired Receive Connector properties. 3. Send Connector limit. This setting affects outgoing emails. Edit the settings for the Windows SBS Internet Send SBS connector. 4. Mailbox limit. Finally, if you really want to, you can set a user to have additional settings, different to the organizational limits. Note that this only affects internal messages. not external incoming or outgoing messages. Change the properties for the Message Size Restrictions (which is not set by default). The Microsoft Public Folder Distributed Authoring and Versioning (DAV)-based Administration tool – PFDavAdmin is a great utility to use when working, especially with mailbox permissions, whether they be user mailboxes or Public Folders. With this tool, one can do a mass update of all permissions set in any folder in Exchange. Content information like number of items in folders can be reported. 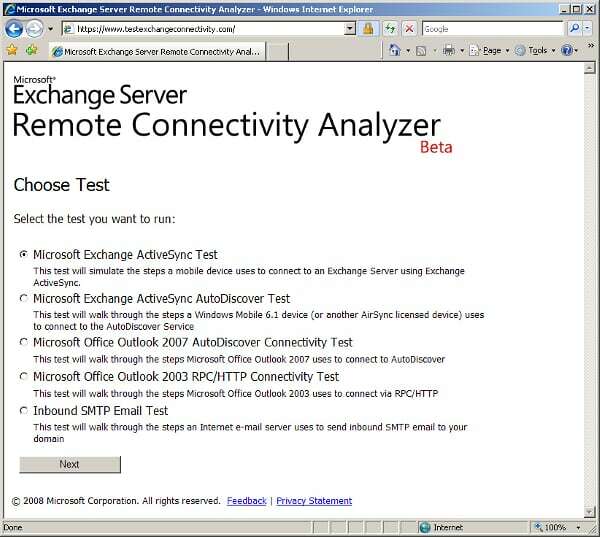 NEW: Microsoft have just release a new version of PFDAVAdmin which fully works with Exchange 2007. Thi can be downloaded in the link above, which has been updated. This has cropped up a few times at different sites over the past few weeks, so I thought I would post it here for quick reference. Exchange mailbox stores were shutting down on a daily basis. This was affecting iPhone, which apparently “wipe out” the data (i think the data becomes unavailable), when there is no connection to the Exchange server. To workaround this, switch of the “push” action for email collection on the iPhone. This will also significantly increase the battery life if you nromally receive a lot of emails. To increase the size of the Exchange mailbox store from it’s default of 18GB, do the following. Create a New DWORD Value, “Database Size Limit in Gb” and set it between 1 to 75 as required. The default is 18 (of course). Restart the MS Exchange Information Store service. I found a new site that tests your server’s Exchange functionality. A great online diagnostic tool. Here’s a cool little gem I just found in Exchange 2007 in SBS2008. 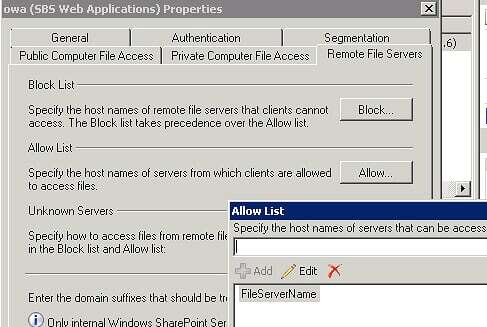 You can access the server (or other servers) shared folders from OWA by enabling Remote File Servers in Exchange 2007. 1. Open up Exchange Management Console, Client Access, and Properties for Outlook Web Access. 2. In the Remote File Servers tab, Click on Allow, and add the file server name. In Outlook Web Access, click on the Documents tab. 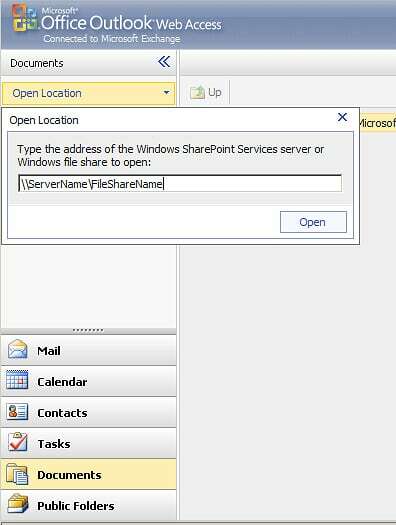 Click on Open Location, then type in the file share location in the form of \\servername\sharename. *** UPDATE August 2010. Unfortunately, Microsoft disables this feature in Exchange 2007 SP3, and also in Exchange 2010.